Polk State College and the Polk State College Foundation recognize the vital contributions afforded by scholarships to make possible educational opportunities for Polk State College students. We express our deepest gratitude to all the individuals, businesses, and foundations who have chosen to direct their philanthropy to help students succeed. As a donor, how much would I need to give to benefit a student seeking an Associate degree at Polk State College? 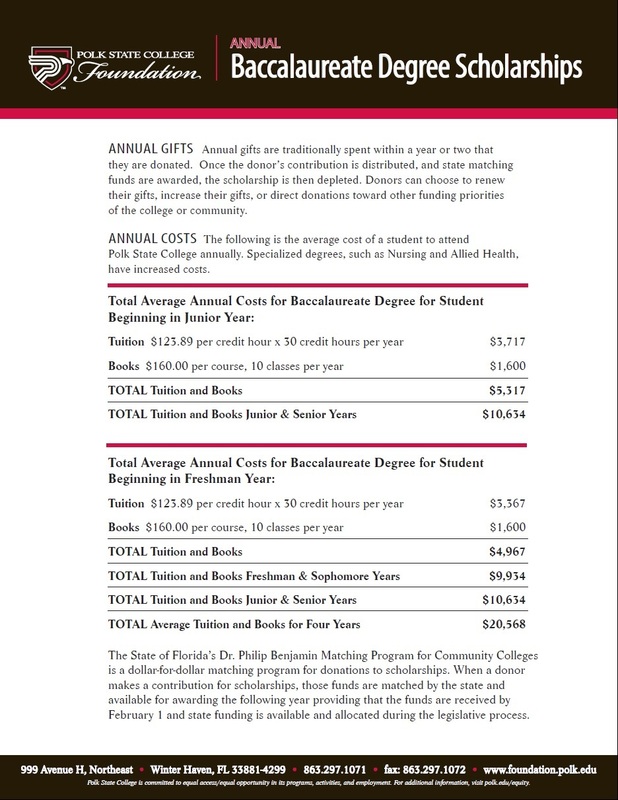 How much would I need to give to benefit a student seeking a Baccalaureate degree at Polk State College? There are many ways that you can help, including making a donation right now. Annual gifts are traditionally utilized to help Polk State College students and enhance College priorities in the immediate future. These contributions make a tremendous impact on current students and Polk State College needs and are spent until depleted for their designated purpose. For more information, please contact Polk State College Executive Director Tracy Porter at 863.292.3743. Endowments leave a legacy at Polk State College that will help Polk State students attain their dream of a college education in perpetuity. The principle of the endowment is wisely managed, while a portion of the return of investment – based upon the Polk State College Foundation’s current spending policy is utilized for scholarships, programs, technology and equipment. 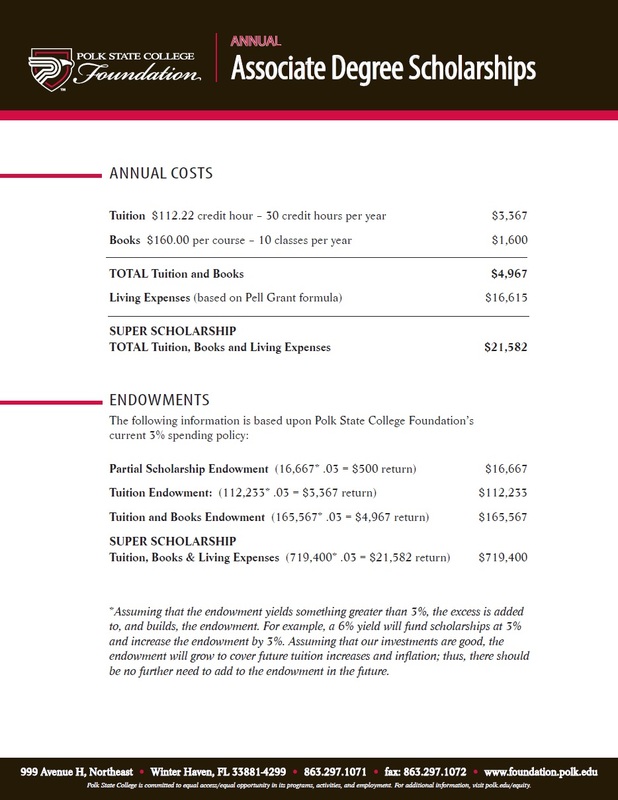 Endowments start at $10,000 and can be made payable over time. For more information, please contact Polk State College Foundation Executive Director Tracy Porter at 863.292.3743. Planned gifts provide you with a way to help yourself, your family and Polk State College. We understand that your own financial needs and those of your family come first. Planned giving options provide the opportunity for everyone to benefit. Your needs are provided for now, and the needs of Polk State College are provided for later. With your legal, financial and tax advisors, we can help you create a plan that suits your personal circumstances. For more information, please contact Polk State College Foundation Executive Director Tracy Porter at 863.292.3743.